Identification: Tiny wasp with large red eyes, a broad thorax, short antennae, and an abdomen that tapers to a point. Biology and life cycle: Female adult wasp finds a fallen flower bud containing a boll weevil larva. She lays an egg next to the weevil larva. The egg hatches, and the wasp larva eats the weevil larva. 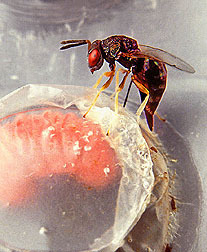 The adult wasp may also feed on the weevil larva's blood. Adult wasps live about forty-five days. Habitat: Cotton plants. Native to Mexico. Catolaccus hunteri is a related species native to the United States. Feeding habits: Adults and larvae feed on boll weevil larvae. Economic importance: Excellent biological control of a major agricultural pest. Insight: Boll weevil damage in 1994 cost the cotton industry more than $300 million. According to Agricultural Research magazine, the figure is probably a lot higher today. Release 100 to 1,000 catolaccus wasps per acre per week for six to eight weeks beginning early in the spring. Using the beneficial fungus Beauveria bassiana also works well on the boll weevil and can be used in concert with the release of catolaccus wasps. Here's a good site for more information.